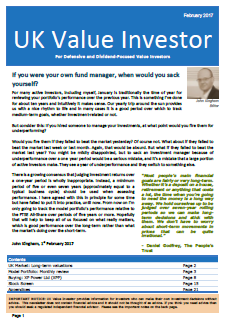 UK Value Investor is my monthly e-newsletter for investors who want to build and maintain a high yield, low risk portfolio of shares. The idea behind the newsletter is simple. Find attractive stocks: Every month I would create a list of about 200 dividend-paying stocks and rank them according to their income, growth, quality and value characteristics. Avoid value traps: I would then do detailed research on one or more top-ranked stocks with the primary goal of avoiding value traps. Improve the portfolio: I would make one buy or sell decision each month in order to maintain or improve my portfolio’s yield, growth rate, or both. After a while I realised that other investors might find this approach helpful, so I started publishing my private stock list and company research as a monthly newsletter, written in plain English for people with busy lives. Today the newsletter goes out to more than 200 subscribers every month. It has become my full-time job and I spend most of my time thinking about how to improve both the newsletter and the underlying investment strategy. If you want to know more about the investment strategy, have a look at these investment strategy articles, or read my book, The Defensive Value Investor. A unique defensive value Stock Screen: The newsletter’s stock screen contains more than 200 companies from the FTSE All-Share index. Every stock in the screen has a ten-year unbroken record of dividend payments and is ranked on a combination of its income, growth, quality and value characteristics. A high yield, low risk Model Portfolio: The newsletter’s model portfolio holds around 30 dividend-paying companies, all of which have been selected from the stock screen over the last few years. Each issue of the newsletter includes a complete breakdown of the portfolio’s holdings, position sizes, sector diversity and more. There are also regular updates covering new annual and interim results for the portfolio’s holdings, as well as other notable events such as mergers. (disclosure: More than 90% of my family’s pension pot is invested in the same shares as the model portfolio, so I definitely “eat my own cooking”). Detailed buy and sell reviews: Each month one company is added to or removed from the model portfolio. The choice of what to buy or sell is based partly on the company’s stock screen rank and partly on an extensive hands-on review. These reviews are typically around five pages in length and explain, in detail, why that particular company is being bought or sold. You can read sample issues of the newsletter here. Read every back issue: Going right back to issue 1 from 2011. Download stock screen data: With the online version of the Stock Screen you can sort, select and download the latest data as a spreadsheet for further analysis (updated daily). Quickly find reviews for all current holdings: Using the online Current Holdings table you can find and read every holding’s purchase, annual and interim reviews in just a few clicks. A FREE copy of my book, The Defensive Value Investor. Exclusivity: With subscriber numbers strictly limited to 300. A 14-day money back guarantee: If you’re not 100% satisfied just cancel within your first 14 days for a full refund. Do you back your ideas with your own money? Yes. More than 90% of my family’s investments are held in exactly the same companies as the model portfolio. Your subscription will renew automatically until cancelled. What will the subscription price be when I renew? Your subscription will renew at the same price each year, so you will see no price rises, ever. There is no long-term contract and you can cancel anytime. Just send me an email or use the contact form on the website. If you cancel within your first 14 days you’ll receive a full refund. Regulation: This service is for informational and educational purposes only and does not provide investment advice. It is therefore not regulated by the Financial Conduct Authority. It is for investors who can make their own investment decisions without advice. You should always carry out your own research and factual verification and come to your own conclusions before making any investment decision. If you are unsure of an investment you should consult a regulated independent financial advisor. You must read and agree to the terms and conditions before subscribing. Risk warning: The value of shares and the income from them can go down as well as up, so you could get back less than you invested. You should not invest with money you cannot afford to lose. You should invest with a time horizon of at least five years. Past performance is not a reliable guide to future performance. Private investors only: This service is for individual private investors only. If you are a professional investor or financial advisor and would like a corporate subscription please get in touch.